1. 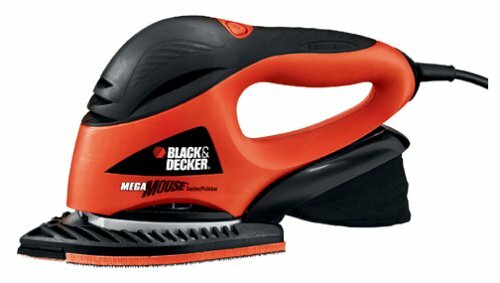 Black & Decker G850 4-1/2"
4. 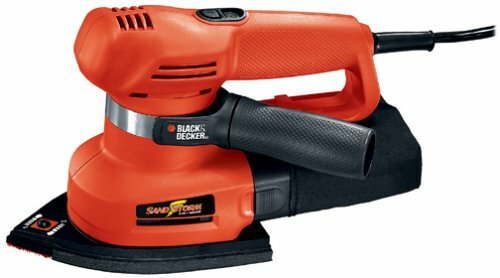 Black & Decker 7750 4-1/2"
9. 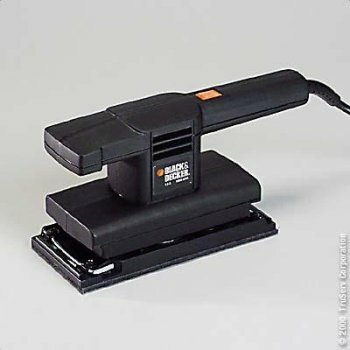 Black & Decker BR300 3"x18"
12. 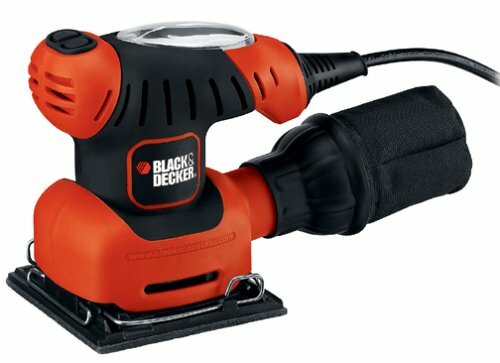 Black & Decker BR400 3"x21"
Where is the UL seal? This is an excelent grinder. I delayed getting it because I could not determine why it was not UL listed. I have two other grinders... a top of the line Sears Craftsman and Dewalt's best model... it's easier to have three grinders than to be changing attachments all the time. I didn't want to by a third top of the line unit. This one is comfortable, powerful, and the power switch is in a logical location and is easy to turn off quickly... beware some other low-priced (non-UL) grinders have a very clumsy switch which could be difficult to ulock and turn off in an emergency. I have not been able to determine why this one is not UL listed... I called B&D and they gave me the run-around... I bought the grinder anyway. I've had my B&D 7448 for a bit over 4 years. I use it a lot and use it hard. I'm impatient so I push tools hard instead of letting things take their normal course. I've never had a problem with the paper coming out, ever. In fact, on mine it's very tight and clamps quite hard. I wish the levers were larger. As far as "how it's made", mine finally got VERY loud and ran slow and erraticly - I found the upper "brearing" is a plain sleave. The other sealed ball bearings are perfect, but the top "bushing" by the brushes is shot to heck. It's gone. Yeah, I push, but for a few cents per unit, a ball bearing here would make it quieter and make the whole unit last longer over-all. It's light, easy to use and the next best sander costs over twice as much, so I can replace a couple of bearings in 10 years and still have a cheaper sander .... Takes about 5 minutes to disassemble the sander and replace the bearing - takes longer to go get the bearing. I have spent countless hours and reams of sandpaper using this sander for at least 8 years and it's still going strong (used mostly on softwood). It is powerful enough using 60 grit paper to take down dowel ends, round edges and level uneven wood height (even end grain). After 60 grit, I use 100, 150 and finally 220 grit for a perfect finish. The 1/3 sheet size gives the unit a stable footing on the work. The unit is made for two hands but you can use one hand comfortably especially with fine grits. Paper changes are pretty fast but could be easier if they made the lock levers a little bigger. The best way I found to get the paper on easier is to clamp and crease one edge first, flip the paper around, clamp the other end then attach the first pre-creased edge. Be warned that you can expect dust to go all over the place using this unit. It is best used outdoors or like I do, with the garage door open and a fan blowing out over the work. If I do replace it, it will be to upgrade to a 1/2 sheet sander with a dust bag (at four times the price!!). I own two of these, and they both have given up the ghost. This is the first bad review of a tool that I've given here[...], But I feel that the truth should be known. First of all, this thing takes way to long time to sand down anything. Either it eats the paper too fast, or like on my second one, the clamps were not strong enough, and the paper kept falling off. Not to mention that this thing is louder than my table saw.It's been a few years since mine died, and I've come to learn one undisputable fact. If you buy a low cost tool, you'll get poor results. 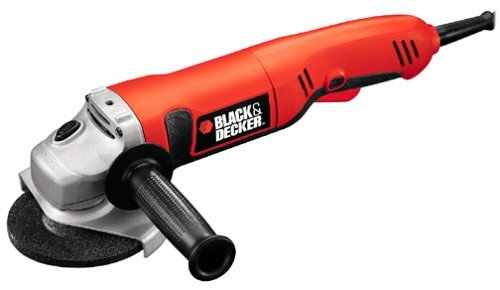 What upsets me is that Black and Decker knows what kind of tool this is, but they still continue to make it the same way. No improvements at all. When I compare this to what I have now, they'll never get my money again. Don't put good money after bad. If you can't afford a high dollar sander, Ryobi has got a dandy little sander at an affordable price, and it's a heck of a lot better than this one. Buy anybody's but this one, you'll be glad you did. 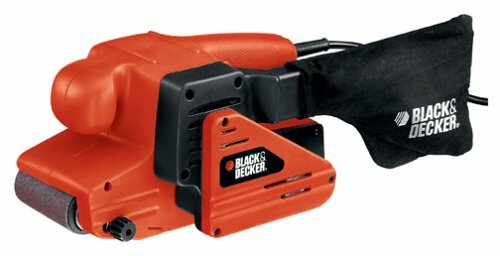 Sorry, Black and Decker, But I call it as I see it. The paper will not stay on! I repeat. The paper will not stay on. Spend more and get a product that does what it was intended to do. This product does not! I bought this some time ago to use as a general sander. It is too light duty and too much "try to please everyone," though. The thing makes waay to much noise, I hope MY dust collector (not ONCE have I taken dust out if it since it has never collected any) fell off, it seems that some plastic piece rattles around in that area and is magnifying the noise the sander makes. As I said, although this sander does sand, I would not recommend it even for medium jobs, such as sanding a piece of wood with rough paper (grits 50, 80, 120) before you get to the finish (220+ grit) step. It just takes too long to sand with this sander. Also,a *big* bother for me: The sandpaper you can get for this at a superstore comes with tear-away pieces for the other B&D sanders (mouse, detail, whatever). Well I hate it because the stupid sandpaper tears in the tear away perforations (since this is the biggest sander you don't have to tear anything away to make it fit) and I strongly believe this has made the sandpaper last WAAAY less than normal. This alone is reason enough for me to say "don't buy this thing." The "produce a single sheet of sandpaper for all our models" idea makes sense to some dumb marketer at B&D, but you're stuck with the self-destroying sandpaper. Man do I hate changing the paper because it is torn away at the tear marks and not because I have used it up! If I were a prospective buyer I would skip this sander and buy a better quality one from the "serious" toolmakers like Porter Cable, DeWalt, Bosch or Makita for about the same money for a base model sander. Bottom line: I own this sander and I'm about to replace it with something different. Sander okay for small sanding project. Dust collector fell off after first use. Once supplied sandpaper with kit is used, it is impossible to locate additional paper. I used one on only one piece of furniture, the allen wrench fruitless whirled around rendering the "interchange" parts all useless. The sawdust collector appears not to be connected to the unit at all. Dust all over the place except in the holder. 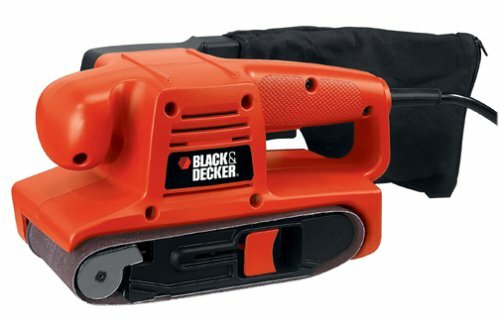 I tried 2 of them and will return the second soon - Worthless- correct your flaws Black and Decker! This was a present from my family. While I am not a big fan of "do it all" tools, the Mega Mouse sander seems to do the job. For what it is designed for, it does quite well. Small to medium project sanding seems to be what this tool is designed for. If you are going to sand a floor, you should get something that is designed for it. On the other hand, if you are working small projects, this is it. Even medium sized work, in my case a 6' X 4' deck that serves as my front porch. It needed sanding after some pressure washing, and I did not look forward to doing it by hand. Out came the Mega Mouse, and it did the job very nicely. I am satisfied with the product so far, and I reccommend it as long as you realize that you are not getting a heavy duty belt sander. Keep this in mind and you won't be disappointed. The four star rating is due to the plastic case. Too tight, too hard to get everything back into it. But so far that's my only quibble with the thing. I would recommend this tool to any handyman, I have used the sander and am very well pleased with it. Don't throw away your money! I purchased this as a backup sander to my makita ros. Any pressure placed on this sander other than its own weight will greatly decline the rpm's. After just a few hours, this sander lost all of what power it had and it now resides in the trash. It's loud and it has a terrible vibration. Take it from me, spend a few more dollars and get a makita! B & D's are nothing by throwaway tools. Inexpensive, light weight and works really well. What more could you ask for.... After only 2 hours of use the handle part simply fell apart. The plastic casing started to literally go to pieces. Maybe an occasional defective one that got thru inspection. Exchanged this one for a new one. Same story. I think the vibration is too much for the casing. I sanded for weeks with this sander! This is an easy to use orbit sander which can be used for refinishing desks or other projects. The 5-inch pad with Velcro brand hook & loop fasteners is so much more advanced than the ones they used to make. You can now easily change out the sandpaper when you need fine or coarse sandpaper. The built in dust collector is a real boon. Not only did my first sander not have one....it also made me cough and left dust all over the garage. This is so much better! This is a good little sander for the casual woodworker. I have had two, my dad stole the first one I had. It sure beats those belt sanders, which cost about the same price to rent. They also pull you half way across the room! Seriously, this it so much better! 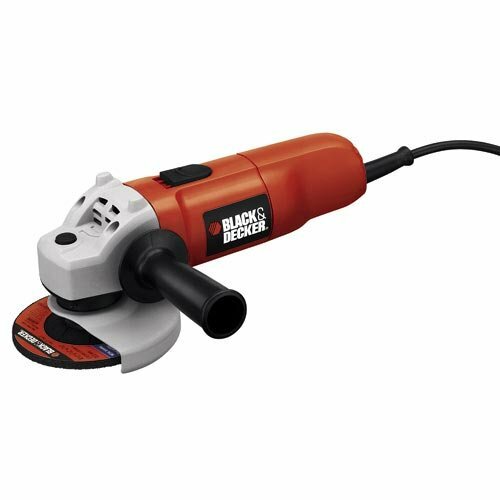 The smooth, contoured grip on Black & Decker's Mouse sander/polisher fits snugly in your hand, making this tool remarkably easy to use. The two interchangeable bases are easy to put on and take off (although we had to do it a couple of times to get the hang of it). 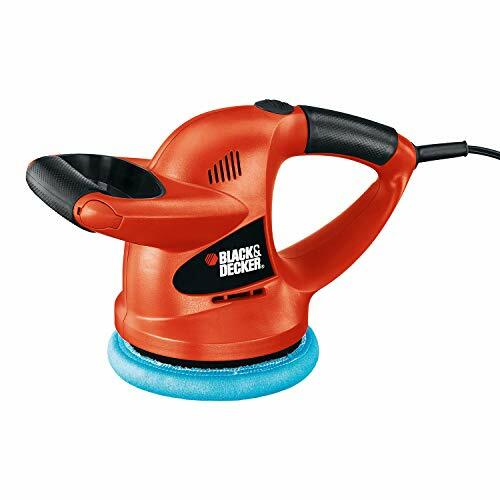 The iron shaped base is specially designed for larger sanding, scrubbing, and polishing jobs, while the base with a detail tip is perfect for maneuvering in smaller, hard-to-reach areas. The Velcro fastening system makes paper changes quick and easy, saving you both time and frustration. And, because the tip of the sandpaper commonly wears out first, each sheet of sandpaper comes with an extra tab; simply rip the tab off along the perforated lines and use it to replace the tip when it wears out. The Mouse runs at 11,000 orbits per minute, a nice balance between strength and finesse. 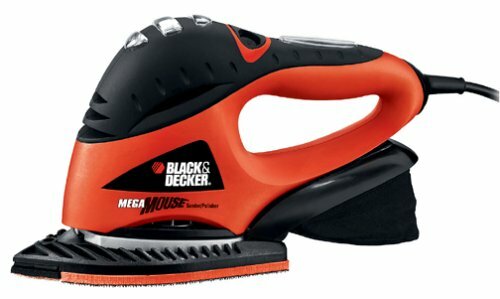 Nix the Velcro, Black & Decker! 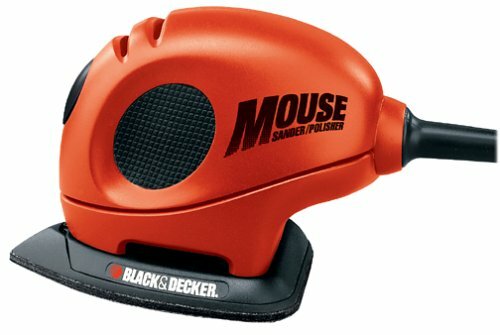 I am an avid woodworker and use my Mouse on a daily basis. The only problem I have with this sander is that if you, like me, change sanding pads frequently - either from heavy use or to change to a finer/coarser grit sand paper - you will find that the velcro adhesive comes apart from the base. I tried gluing the velcro back on, which works as long as I don't change pads again. Once I change the sandpaper out, no matter how careful I am to hold the velcro while pulling the sandpaper off, the velcro still will not stay. I have considered buying a different detail sander, but do like the Mouse for its lightness and orbiting features. 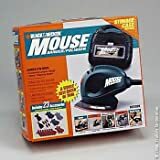 The Mouse's size also enables me to get into smaller areas, which helps with the type of woodworking I do. Because of the positive features, I have settled into a compromise with the beast. I no longer have the velcro on the Mouse at all, but use adhesive sandpaper which I put directly onto the cushioned pad where the velcro used to sit. I have to trim the sandpaper to the correct size and shape, but it works just as well. If it weren't for the velcro pad not holding up, I'd give this little sander five stars. I bought this sander primarily as an inexpensive detail sander. I figured that I'd have to resort to using the "finger" base plate, but have found that the steam iron shape allows great access to corners and tight spaces. Does a good job at (quietly and without a lot of vibration) smoothing out paint between coats and doing fine finish work. If you need to remove a lot of material (i.e. : very rough or very large surface), I'd recommend a random orbit sander, 1/# sheet, or belt sander. The case is convenient, as it holds a lot of supplies. It is not, however, what I'd call heavy duty. The sander does go thru sandpaper quickly. I agree with other reviewers--I'd be nice to be able to buy it in bulk. 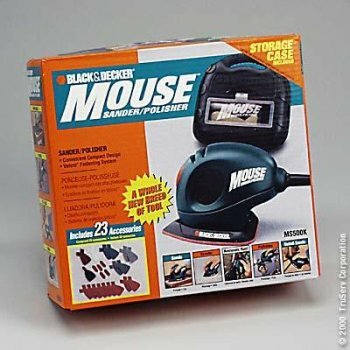 I see this sander less and less in stores; I hope that B&D is not discontinuing this product in favor of the Mega Mouse. That might make finding supplies for the Mouse more difficult. I've had my mouse for about a year. For the most part, it's had very light use. Recently, I started using it more and it's had moderate use this summer. It fits my hand nicely, is friendly in terms of ease of use but the hooks on the pad have worn down to nothing. The sandpaper simply won't stick. I'm pretty disappointed since I'm in the middle of two projects I'd like to finish up before the rainy season begins. And it's had light use. I've tried to find a new "interchangeable pad" for the regular tear drop sandpaper but there don't seem to be any. So I'm faced with purchasing another mouse or trying something else. The motor seems fine so I'm reluctant to buy a whole tool when it just needs a $5 part. Also, the Black and Decker sandpaper wears very quickly. Fortunately, there are other makes of hook and loop sandpaper and these have been much more satisfactory. Lightweight and versatile little tool. I concur with all the positive reviews here but must point out that B&D's supplied sandpaper is little use. You'll need a quality brand from Home Depot or the like. Makes short work of any small area. I'd recommend something larger is you do a lot of sanding but this is perfect for most home users. The first mouse I got (as a gift - I asked for it) had its motor go bad after just a few uses. I exchanged it for another. Then on the next one, after just a few uses, the velcro loops are wearing off on the tip, making the sander effectively useless as it now doesn't hold the sandpaper in place. I need to get a new pad with the velcro loops, but you can't get it at any store - I've got to order directly from the manufacturer (haven't tried yet but I have their #). I wish I'd read the posts warning about the cost of the paper before I bought the Mouse. It's a very useful little tool, and it's easy to think of uses for it. Unfortunately, each use means a trip to the store for paper or pads. The paper is horribly expensive, and it's not feasible to substitute for it. I've used my Mouse on only about a dozen minor projects over the last year but have easily spent 3X the original cost of the unit on paper and pads. This is a useful and well-made sander, but it only uses Black and Decker paper that costs [a lot of money] for 5 sheets (if you can even find the paper - it is here on Amazon.com, but usually is hard to find at a hardware store), making it too expensive to use a lot. Orbital sanders with standard size disks or palm sanders that use 1/4 sheets of regular sandpaper are much more economical - about one tenth the cost. It has performed well the times I used it, but I almost never use it due to the expensive paper (that lasts no longer than other paper - you will use up several sheets on a small project). Can anyone help me? 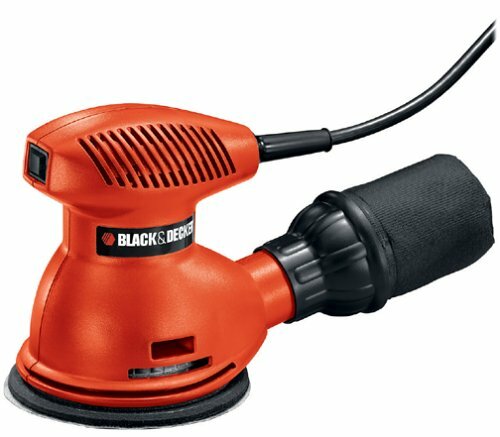 I need information on a 3" X 24"Black & Decker Sander, a B-245, TYPE AB. Specificaly the size and description if the Drive Gears. Thanks. Most of the time, I buy the tools that get the best reviews... and when it comes to a router, planer or table saw, that's not a bad idea. In my world, it's unnecessary to apply the same scrutiny to a belt sander - after all, this is not a tool for finish sanding. This is for fast, aggressive removal of material. I wish I'd have bought something else . . . This was my first electric sander, so I can't compare performance, but I agree with the other reviewers who point out that it doesn't collect dust the way it's supposed to. Despite others' enthusiasm for the hook and loop feature, it didn't turn out to be all it was cracked up to be. If you're doing a bigger project (I was sanding down the wood trim on a window I had stripped) the paper wears out pretty quickly, and they're not exactly cheap. It's better than sanding by hand, but I wish I'd [pulled] it up and spent a little more to get a Bosch or something like that. I purchased the sandstorm for my husband, he was thrilled when I showed it to him. Since then he has used it several times and says that it is the nicest sander he has ever owned. The hoop and loop feature is great, it makes changing paper fast and easy. Also, it has very little vibration which makes it more comfortable to use. No more dips in the wood. And now the wood is left much more even. I would highly recommend to any wife buy this one for the husband they will be thrilled. Mine fell apart within a yaar and a half, and I haven't bothered to try to get it fixed. Most of the time, it sanded pretty well, and I love the hook and loop. But, this isn't the model to get. I am finished with Black and Decker tools, I have never had one last more than a couple of years. Spend the money for the better tool, it will make for a better result, and there is nothing more aggravating than having the pad fall off in the middle of your project. If you are buying a gift for an aspiring woodworker that you love, get a Porter Cable, Makita or DeWalt. Mine was a gift that I was too sappy to return... Now, I am asking for a new Sander for Xmas, think it will be a Porter Cable. This model combines the effectiveness of a random orbit sander with the detailing of sheet and detail sanders at a pretty good price. I found it easy to attach the orbit and detailing pads, and the velcro does a good job at keeping the sanding pads in place. The only negatives are the sound (it's noisy), the fine detail pad lost its effectiveness quickly due to wear (thankfully, B&D includes several extra detail pads), and most of the dust ends up all over the place instead of in the collection bag. I still recommend keeping some old-fashioned sandpaper or a sanding stick handy for detail areas and hard-to-reach places. For standard household work, this sander worked well for my most recent sanding project (sanding a window moulding). As I said before, the 3-in-1 features make this a good buy. Pay a little more and spend less time. 1. This sander is a bit quieter than my old one, but not much. 2. The gel-grip design on this sander is fantastic - no more tingly hands after sanding for a long time. 3. The dust collection works decently, and is of course a vast improvement for me since my old sander had no dust collection. 4. It is very affordable! I guess what I am saying is that for what it is, this is not a bad sander at all. 1. This sander came with a separate plastic jig to use for punching the dust collecting holes into your sandpaper. I really wish there were another way to accomplish this since the jig never seems to be handy and/or where the sander is. 2. Although it IS quieter than my last palm sander, this thing is still uncomfortably loud. 3. The on/off switch is located in a perfect spot, but I wish it were not so recessed. Sometimes I have to fiddle around trying to get the thing on or off. The miniute i turned this thing on it went flying, no doubt i had my 100 ft. extention cord hooked up to it and it took of like my new truck WITH A HEMI V8 BABY!!! I chased that ting until it ran over my neighboors annoying chihuaha. i didnt have to put up with the annoying barking for months. id give it 10 stars! Rivals any of the more expensive model sanders. I recieved this polisher as a gift and could not have been happier. It is easy to use and light enough that most people can reach with it and still maintain control. Although the thought of a cordless unit is nice, I just can't see the same ROI in the long run. I noticed that someone wrote a review stating that the pad blew apart, I luckly had no issues with this being a problem. Besides, it's B&D, they have fantastic service and you can get parts or a replacement unit easily. It would be nice to have a bigger pad relative to the body width, but with some creativity I have enhanced the diameter and outfitted it with some alternate pads.